Crown Paint and the Royal College of Art embarked on a new, exciting and unique collaboration. The second year students were asked to design the 'Crown Jewels'-modern, stylish and inspired wall stencils for the home. 'Image Furniture' by Kyu Seon Lee was the winning stencil design. The stencil shows a chandelier created from household objects. Keys, corkscrews and glasses can be hung over the silhouette, acting as a fun frame for everyday objects. "I designed a stencil which takes furnishing objects as flat images. The reason I chose to do this is because some houses do not have enough space or height to accommodate something as opulent as a chandelier, but with this stencil it is easy to integrate the object into your home" says Kyu. "In addition, I wanted to give a little practical function and humour to my design by encouraging real objects to be incorporated into the stencil." 'Image Furniture' Kyu's winning stencil can be ordered from The Stencil Library. At five feet high (153 centimetres),this is no timid stencil design. I think it is fabulous. I would like to play with the stencil and see how it looks when the real objects are hung over the stencilled shadows. Can I resist the temptation to start adding my own embellishments? I doubt it, but I think that is the spirit of the design. What do you think? Love it or loathe it? You can actually use various products to stencil onto glass to give the sandblasted look: frosting/etching sprays and cremes are two of the most popular products. You can also use our stencils for sandblasting (apparently they hold up really well in the process). We are also happy to sell digital files of our stencils for one time, personal use if a traditional stencil won't do the trick. In this case, our customer needed to stretch the proportions of the design to get it to fit the panel. The stencil she chose is DE351 from our Art Deco range. I think you will agree, it looks great on the glass and gives added interest to the plain pane. Recently, Royal Mail (our postal service) issued a set of stamps celebrating the best of British design. ...the Spitfire, the miniskirt, the red telephone box and the polypropylene chair. In honour of these stamps, I will feature our own CO7 Stamp stencil. A design classic? Maybe too quirky for that, but then a lot of iconic designs were first thought of as quirky. What are your favourite design classics (British or otherwise)? Every year, there is one animal print that is hotter than the others. I don't know how it happens, but it seems that all fashion designers would agree on the same print. The other day, I was tripping around the shops in town catching the tale end of the winter sales and the beginning of the new spring fashions. I came back to the office and said, "Snakeskin!". Based on what I could see, I was certain that was going to be the animal print of the spring/summer 2009 season. Sure enough, as validation, I open my new issue of US Vogue this morning and there it is on the "Need it Now" page. How fair is this? Melanie Royals, stencil supremo gets to create this lovely stencilled panel. She does this in a beautiful house called Peacock Pavilions in the warmth of Morocco. Her accomplices are talented artists who are also friends. In between stencil projects, they go quad biking, feasting and shopping. Read about in either of their blogs. Bitter?? Of course I'm not bitter, but look at what I had to stencil this week! Yep, I got to do eight of these beauties above fire doors in ugly storerooms in the coldest UK week for decades. Alone. Ps Melanie is the one in the red scarf. The group photo came from her blog. and made lacy shadows from net curtains. It landed on a bowl full of mirror balls where it exploded into tiny pools of light. I had to grab my camera and capture it. 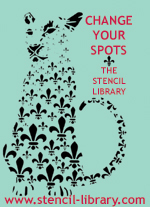 Throughout February, Carol Leonisio is hosting '28 Days of Stencilling' on Stencil Talk blog. If you have a photo of a stencil project that inspires you or one of your own work, please send it to Carol at this address: paintit@comcast.net. Mine was featured on day 2. Anyone who knows me, knows that I love and collect vintage clothing. My favourite era is the 1930's-1940's, but I still look at other decades as well. Recently, I was on the fabulous Vintage Textile web-site. Now this is a site is for serious collectors. They have the most fabulous collection of museum-worthy pieces. I was dribbling over a Fortuny Delphos gown in the most gorgeous cornflower blue (that is the pleated fabric Fortuny was famous for), when I came across another photo of the gown and a long velvet robe over it. I had forgotten! Fortuny was also famous for his patterned fabrics. He was particularly fond of printed velvets. That set me off on a mini investigation to find out more as they are perfect inspiration for what can be achieved similarly with stencils. Mariano Fortuny was a man of many talents, but he is perhaps best known as a couturier. His clothing was quite advanced, adventurous and unconventional for the times (the best always is). His most famous clients included Isadora Duncan and Dorothy and Lillian Gish. He was most prolific from about 1910 until 1930. He drew influence from lots of different places, but was particularly fond of renaissance, medieval, classical greek, byzantine and ottoman styles and these are prevalent in his clothing designs and fabric patterns. His style no doubt influenced others. Also on the Vintage Textile site are pieces by the designer Gallenga. They also look heavily stencilled. Once I started reading up on Fortuny, I became inspired to create some stencilled velvet clothing myself a la Fortuny. He tended to favour metallic colours on velvets. I know that in some cases he used several shades of metallic colours to create an authentic antique look, but you can use less if you like. The pile of the velvet will automatically add subtle shades to a single colour. I am a big fan of lounging (makes me sound like a couch potato, but I can assure, there is a marked difference - one is good and the other is not). One of my favourite (and quick) items of clothing to sew is a pair of 1930's style wide leg lounging trousers. I have these in silk, satin and even good old plaid flannel and I live in them at home. As soon as I get in from work, a pair usually goes on. I have summer weight ones and winter warmth ones. So I thought I would make a velvet pair. I had some white cotton velvet so dyed some lengths up in different colours. I decided to make the lounge trousers out of the jade green velvet. I used Dylon fabric dyes, but in the US, you can use Rit dyes for easy fabric dying at home. Once you try dying fabric, if you are anything like me, you won't stop. It is great fun and a fantastic way to revive something or simply change it. I chose our stencil DE82 from our Arts & Crafts range. Arts & Crafts is the appropriate era and also is a gothic revival style so I knew Fortuny would probably approve. I simply stencilled it in our Metallic Gold stencil paint. Then I sewed the fabric up into lounging trousers. I also dyed a length a vibrant orange colour. I have stencilled it in an Art Nouveau pattern, DE234. This is less like the type of pattern Fortuny liked to use, but I was still heavily influenced by the look. Again, I used Metallic Gold paint and have added a bit of Brilliant Purple acrylic paint on the petals of the irises. I think I shall make this up into a short kimono style jacket when it is finished. If you fancy reading more on Fortuny, then I recommend the Fashion Memoir Fortuny by Delphine Desveaux. It is short, but comprehensive and has some wonderful photos. If you fancy owning original Fortuny clothing or fabrics, then the only site to go to is Vintage Textile. And if you needed another excuse to visit Venice, then there is the Fortuny museum there that I am sure would be fascinating to anyone interested in fashion and pattern. And certainly, if you fancy creating some Fortuny style textiles yourself, well, you know where to get to get stencils. The most authentic ranges to "get the look" will be the Ottoman, Gothic Medieval & Tudor, and Arts & Crafts ranges. This is the interior of The Style Club hair salon in Dublin. At first glance I thought it had been decorated with Stencil Library stencils, but on further inspection I read that the surfaces have been screen printed. A similar look could be achieved with our stencils and an adventurous eye for colour. Should you fancy giving the same treatment to your abode, look at our Brushstroke stencil. It is a repeating design found in our Modern Design section and is similar to the design shown on the floor of the salon. I like the way that they resemble hair clippings. The ceiling pattern has a likeness to our MD3 giraffe in the extra large size. The plaid looking wall is a little fuzzy to see the exact design, but one could use the tartan stencil in our vintage collection to get a similar effect. I enjoyed seeing the rest of the salon through all the convex mirrors on the stripey wall. The photographer is uncredited but I got the pictures from Designer magazine. The designers were Douglas Wallace. I think it is vibrant and exciting, what do you think? We have a post category titled "nice things". Today, however, we could do with one called "not-so-nice things". We heard that Domino magazine is to be no more. We are huge fans of Domino. The editors state that Domino started with the idea "that style is for everyone" and that a "home should make you happy". We couldn't agree more and reading issues of Domino and their website certainly made us happy. Domino was one of the most inspiring interiors magazine full of wonderful features and ideas all to do with your home. We shall treasure and refer to our copies of Domino for years to come. Thank you to all the editors, contributors and writers that made the magazine a joy to read and look at. Times are indeed tough, but it really hits home (no pun intended) when one of our little pleasures, something to take our mind temporarily off the dire economy, is taken away from us. Farewell, Domino magazine, you shall be missed, but at least their book "Domino - The Book of Decorating" is available for us to get a regular fix.